(Newser) – A 4-year-old UK boy is $130,000 closer to traveling to the US for cancer treatment after a mystery donor contributed that amount to the cause. Zac Oliver was diagnosed with acute lymphoblastic leukaemia in May, but he has the near-haploid strain of the disease, which affects just one in 200 childhood leukemia patients. He is thought to be the only child in the UK with that strain of the illness, the BBC reports. 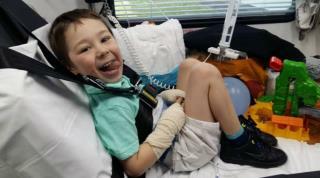 Friends and family have been working on raising the more than $650,000 needed to get Zac to Philadelphia for a promising new treatment the UK is not yet ready to deliver, according to a JustGiving crowdfunding campaign for the little boy. Zac's mom, Hannah Oliver-Willetts, says she was recently shocked with a phone call from someone who told her "not to worry" and to "pack her bags." As a conservative THIS is how it should be. A wealthy donor is ALLOWED to use his own money to save this child with $130K of his own money. If no wealthy donor comes forward, then the child should be ALLOWED TO DIE. No exceptions. The parents, if Conservative, WILL AGREE with me 100% to allow their child to die if they are unable to scrape up the $130K. I know i would gladly let my children die if i did not have the money and no wealthy donor will help me and most certainly would never let the government pay to save my child even for free. But but but why isn't the kid getting it free free free in the UK under their perfect, utopian healthcare system?? To the people who donated: you are a hero -To this boy, his family, and everyone else. For all the negative things I can say about the internet, social media, crowdfunding - let me just say that I am thankful to live in a world where people can spread their personal stories far and wide to strangers who may care. Many people will be sending their hopes for a successful surgery.